Send the gift of good taste! 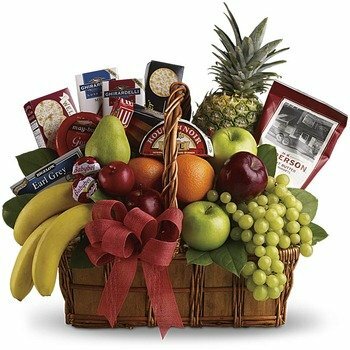 This gourmet gift basket of fruit and snacks is perfect for a gracious hostess, busy new parents, or anyone who appreciates the finer things in life. Hand-delivered by a local florist, the basket overflows with delicious fruit and tasty treats. * Great place to do business!